At Biomeme, one of our core goals is to democratize molecular diagnostics. 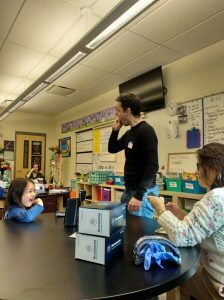 So when our Co-Founder Max Perelman was invited to give a demonstration to the 8th-grade class at his daughter’s school, Frankford Friends School , he jumped at the chance. After all, the key to democratization is education. Max gave a brief presentation about the Biomeme platform and the power of DNA detection. Then the whole class got the chance to extract strawberry DNA using common household items. Shoutout to the awesome folks from The Sci Guys for sharing this awesome lab!!! 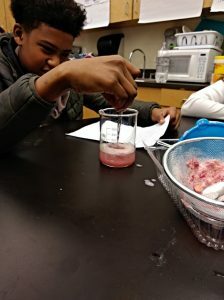 The kids had a great time mixing the ingredients, smashing strawberries, and grabbing DNA with tweezers. Check out this awesome video to see how to extract DNA from a strawberry. 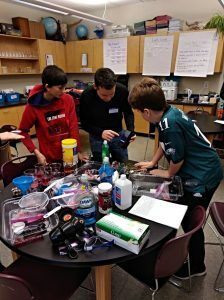 In addition to strong literacy, math, Spanish, and science programs, Frankford Friends School students study innovative design, engineering, and art in the IDEA Lab, as well as music, theater, civic engagement, and physical education. Thank you to the school, and a big thanks the middle school students’ amazing science teacher, Nora Griffin-Snipes. For a parent, there are few things as precious as making your child proud of the work you do. Max and his daughter demo buccal swab sample collection. 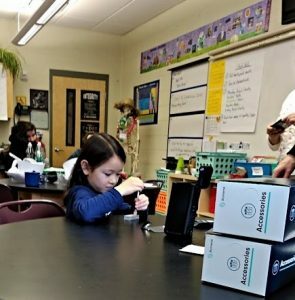 Max’s daughter demonstrates Biomeme’s easy sample prep.